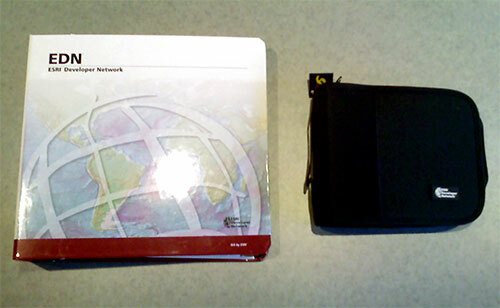 Well I still haven’t received my ArcGIS Server production disks, but EDN 9.2 arrived this afternoon (it is on the right in the black binder). No sign of ArcGIS Explorer though and no mention of it anywhere. Also “The update for the UNIX platform will be shipped at a later date”. **Update - **Maybe I misunderstood the EDN team at the UC, but it looks like ArcView 9.2 is not actually part of the EDN subscription. ArcView is available as an option to your EDN Subscription for an additional fee. You may puchase the ArcView license at any time during your current subscription. Please contact customer service for more information. OK that is news for me, but I may have overlooked it. In that case why not also offer Editor 9.2 as an option?